Back in August I spent 9 days in Slovenia and Venice - here are some of my favourite moments from our trip! We started off our journey by flying from Manchester to Ljubljana, the capitol city of Slovenia. We stayed here for one rather wet evening before heading to the mountains, enjoying a quick tour of the self-declared 'Autonomous Culture Zone,' Metelkova Mesto. The commune occupies the former 'Fourth of July' military barracks of Austro-Hungarian origin. The next morning we set off bright and early to head northwards to the Julian Alps, which stretch from Italy to Slovenia. Our destination was a small hut on the mountain of Talež (Jelovica) spruce-tree-covered plateau overlooking Lake Bled and the North. We arrived late morning and enjoyed a lunch at Koča na Taležu, a small local restaurant and B&B which sat nestled on the side of the mountain, with fantastic views across the valley. We settled in quickly at our mountain hut, which was just 10 minutes further along the road from our lunch stop. The accommodation was rustic, with only limited solar power and a wood burning stove for heat and hot water. With no wifi or phone signal either, we felt wonderfully remote in our small clearing, surrounded by the mountain woods. The wildlife here was abundant, with numerous species of insect and butterfly practically bursting forth from our small clearing in the woods. We also saw several deer at twilight, grazing peacefully in the pasture. 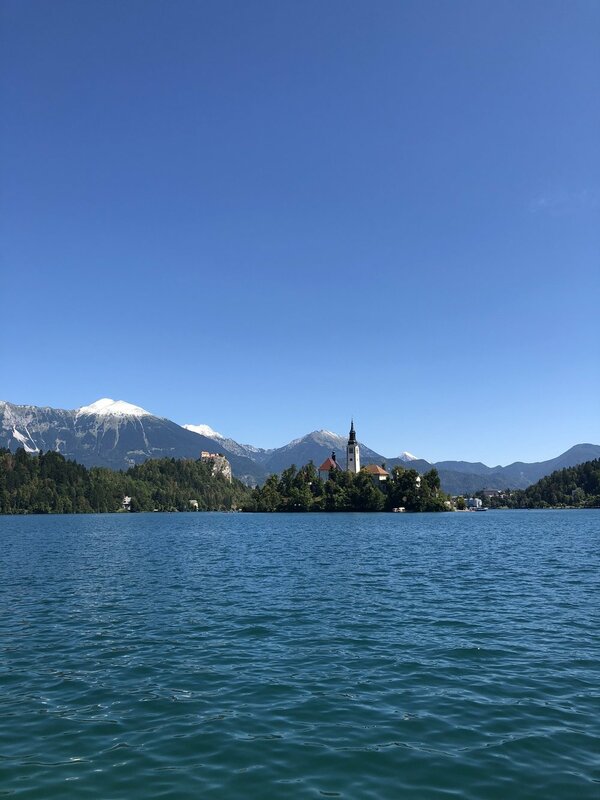 After waking up from our first night sleeping communally in the roof of the hut, we set out in our hire car to the shores of Lake Bled, one of the most picturesque places I think I have ever been. We spent the day swimming and walking all the way round the lake, before heading home exhausted and happy. Back at the hut, we made a fire outside in the designated fire pit (there are heavily enforced rules in Slovenia regarding lighting fires only in official spots). Upon this we slow roasted a joint of beef, covered in spices and devoured greedily as the sun set. For our third day in the mountains, we took the car and drove to our west, over to Lake Bohinj, Bled’s less well known and far more relaxed cousin. Dropping off the car at the foot of the mountains down by the lake (569m), we took the Vogel Cable car up to the Vogel Ski Centre (1533m). As it was summer, there was no snow to be had, but the views were dramatic to someone who lives in the flat Vale of York. We spent several hours walking around the ski centre, taking further cable cars to reach as high as we could go without any specialist walking gear. The views across the alps were breathtaking. After heading back down to Lake Bohinj, we cooled off with a dip in the lake, which if anything was even cleaner than Bled. If you swam to the middle of it, you could look back up the mountain and follow the Cable Car back up to the Ski Centre. I stayed in the middle and floated on my back for what felt like hours. It was absolutely tranquil, even with the excited screams of children who were adventuring across the lake in blow up dinghies. After another activity filled day we retired again to eat at the mountain restaurant, taking in the sunset over Lake Bled. Alas the next day our jaunt in the mountains was over. We packed up and drove the hour back to Ljubljana to spend another night there before our bus to Venice. At this point the whole group felt rather fatigued, so we decided to spend the evening relaxing and cooking in our Air BnB, which had a wonderful balcony overlooking Romain Remains (which were sadly shut to visitors due to a technical fault with the ticket machine). After a fine meal gathered from several supermarkets and market stalls, we sat down to eat and refuel for our trip across to Italy. This is my sixth post in my attempt to write something on this blog everyday in October. Find my previous post from the 5th here.